Legendary Planet: A Fantasy Space Kickstarter! Legendary Games brings you an epic sword & planet adventure saga for Pathfinder and 5th Edition that takes you across the multiverse! Check out the Kickstarter here! And not by ME, either! By GigasGMX. A playlist of filk music featuring space heroes and starfarers. Enjoy! Si la région est bien une ceinture d’astéroïdes s’étirant sur une large ellipse autour du Vortex, Kuaj-Pyoroon est plus communément le nom donné au plus gros planétoïde connu dans le système de Dreyk. Monde aux dimensions modestes, il n’en reste pas moins un domaine convoité, où une certaine gravité assure le développement des peuples séjournant à sa surface. 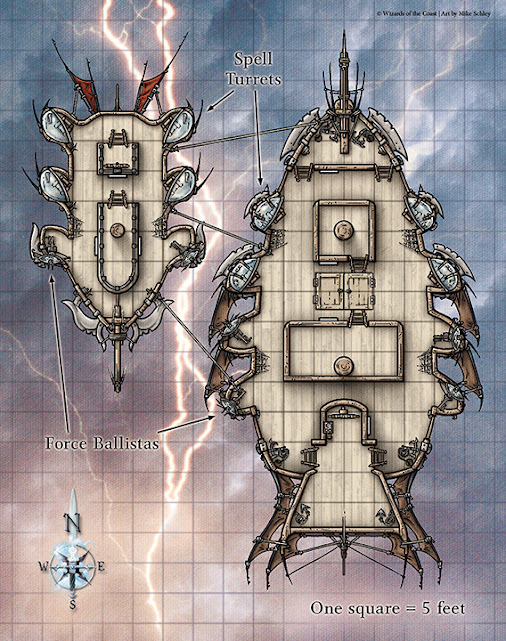 A #DnD #RPG battle map showing Githyanki pirate ships locked in desperate battle? Yeah, we’ve got that now. Check it out and download the DM & player versions here. Well, there’s no accounting for some people’s tastes. Fair enough. I’m not fond of peas or watermelons either. Why do people always feel the need to include this qualifier? Is it because of Spelljammer’s superficial resemblance to space opera? Dude, has it occurred to you that you are playing Dungeons & Dragons?! People throw great balls of fire out of their hands without friction, heat transfer or a power source of any kind. Dragons can fly. So can winged horses, pigs, lions, and even elephants. Giant bugs do not collapse under their own weight and are capable of locomotion. You can teleport without requiring the equivalent energy of a sun. Weird wizardly experiments producing odd crossbreeds continually prove that the rules of genetics are irrelevant. The odds can be manipulated significantly by the use of magic words. Radiation doesn’t break down your cellular structure; it does weird magic sh*t to you. It is possible to accelerate instantly to impossible speeds without any damage to the body. Powerful warriors are capable of a) falling from orbit without breaking their spines b) getting hit by freight trains and walking away from it c) fighting several individuals at once without getting hit at all d) killing entire swarms of little humanoids without being overwhelmed. Also, old warriors never seem to suffer from arthritis. Prayers heal wounds, broken bones, pulverized limbs and deadly diseases. Instantaneously. People can be brought back from the dead. Please tell me exactly when the “laws of real physics” became relevant . . . ?